Superb protection for your eyes, lungs and face—built-in motor prevents fogging and overheating! 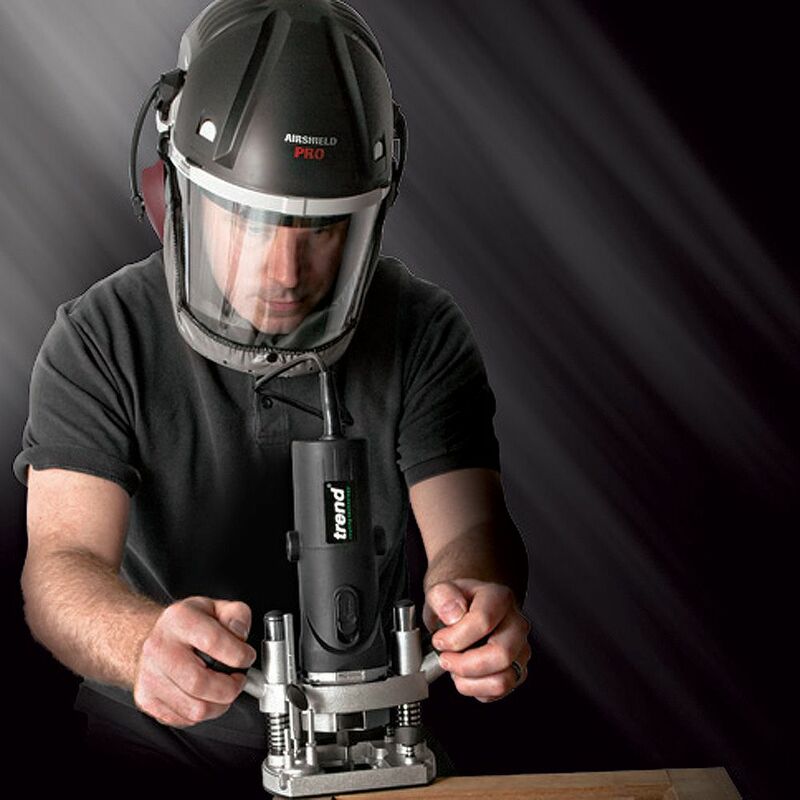 Protect your lungs, face and eyes during virtually any woodworking task with the air-circulating Trend® Airshield Pro. Its built-in fan circulates filtered air to prevent fogging, provide cooling and protect users from dust particulates down to 0.6 microns in size at a 98% efficiency rate. This model also meets ANSI Z87+ standards for eye-protection. It features an improved headband with a ratchet suspension and pivoting nape back strap for enhanced comfort, fit and durability. The nickel metal hydride battery allows for up to eight hours of operation on a full charge, twice the length of previous models. 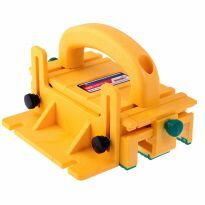 Includes a charger, airflow indicator and pre-installed plastic film overlay to prevent buildup of sap after heavy turning jobs, and to prevent scratching. Fully protects lungs and face during woodworking. Twin filters with 98% efficiency. New high-impact eye protection rating of ANSI/ISEA Z87.1-2010. Approved to new European standard BS EN 12941. Combination face-seal and hood improves protection. Motor positioned away from forehead to reduce noise. Strategically designed for balance and comfort. Works wonderful use it all the time while turning. I have had COPD for a few years now and find this product excellent in protecting my breathing environment in my workshop. I am getting use to the weight, I barely notice the fan noise anymore when tools are not running. I produce a lot of fine heavy dust and I don't get any of it inside the mask. My eyes have not had any dust since I started using it and because I am not using a standard half face mask it is very easy to breath and the circulating air is wonderful. I highly recommend it. Great protection from big things (a chunk of wood flying off of the lathe) and little (clouds of sawdust when sanding), doesn't fog up, and comfortable to wear so I am not tempted to "forget" to put it on. This was a birthday gift for my husband. He loves it and now wants a spare battery. This helmet has helped me so much with me breathing! My allergies and dust are hard to continue woodworking. Since I bought this helmet it’s been great!! I have only had a chance to use this a few times, but I love it for turning. It's very comfortable other than being a little top heavy. Gives me extra confidence when turning and sanding. Surpirsed how much my dust collection system lets by. An excellent product that has lessened if not eliminated harmful dust and fine wood dust. I would recommend this shield/respirator. It fits me well after making adjustments. I didn’t have any difficulty wearing glasses under it despite some reviews I read that indicated otherwise. This device takes the curse out of masks, respirators and goggles. If it could be improved it would be lighter weight and provide noise protection, too. But, you can't have everything and I am happy with this purchase. A very important piece of equipment I wish I had a long time ago. I hesitantly purchased this air shield after reading some of the problems users were having with batteries being charged. I have used mine for over a year and (knock on wood), I use it, it keeps the dust out and it runs 3-4 hours at a time on a charge. In fact I have never drained the battery during use. I plug it in when done using. It can take 24 hours or more to fully charge. It has worked well. I also purchased the ear defenders. They do help block external noise. But the fan in the Air Shield is noisy. The noise radiates thru the helmut right thru the head. So the Ear Defenders don't do anything to eliminate the helmut fan noise. But I still use them. You will think you are going to break the Ear Defender arms when popping them out to remove the helmut. But just put a thumb under eadh and force them out. They do click open and don't break. Works great in the wood shop and outdoors when using a power blower. I am hypersensitive to wood dust and bought this for health reasons, I can still work in shop. I did some woodturning this weekend where I didn't utilize the mask but paid the price of sawdust in the sinus. The next day working on another project with lots of sanding of redwood I put the mask on for the first time. There was sawdust all over the face of the mask leading me to believe I would have been breathing that in. I think I'm really going to like having this especially having the sinus problems that I do. My air shield made the difference between giving up woodworking and continuing to enjoy it! What more can I say? Takes some getting used to. Neck muscles need to build up a bit. Not really that heavy but the new additional weight does need some getting used to. Love breathing clean air while sanding and routing. I have had problems with sinuses for years that is almost instantly aggravated whenever I start breathing sawdust. I have tried a variety of other dust masks from surgical masks to fan powered respirator type masks. All with a at least some relief but not complete. In addition when using a regular face mask for turning I have had problems with the mask fogging over. The Air Circulating Shield has ;really helped with both problems. I have had considerable less breathing problems since I started using the mask and only when I start cutting or sanding, forgetting to put on the shield. My only discomfort when using the mask is the weight and noise of the fan. 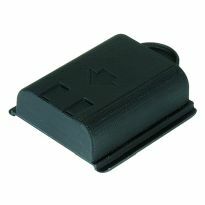 Both problems could possibly be solved if the battery pack and fan were on a separate module which could be fastened to a bent and connected to the helmet by a flexible tube as is used for C-pac machines. Performs as described. There is enough clearance you can wear goggles over Rx glasses. Hearing protection will not cover ears tightly enough to seal against high dB Noise. (Guess I need a fatter [wider] head LOL). Battery recovery time is very, very long with respect to 2016 technology. Does readily clear fogging of the clear shield. Works beyond my expectations. I did buy the optional ear protection. This prove dot be very worthwhile. They cancel a lot of noise. Highly recommend this air shield. After using this for about a month I must say that it was worth the money. works well but the headband starts to hurt after a while. When I first tried it on I was not impressed. After properly tightening the head band. I adjusted my glasses, lower the face mask and turned it on to a light breeze across my face. I thought this was not going to work. I then did the outside and inside of a bowl and then did some power sanding. Face mask collected dust, so I wipe it off. When I got done, and took it off, I noted three important things. First, my glasses were clear with no dust - so it must be working. Second, no dust or grit on my face or eyes. Third, my throat felt no discomfort. After two or three uses, I absolutely think this is the best product ever!!! That being said one lesson from the school of the had knocks. This mask is heavy. You don't make any quick movements with it on. Your neck and trap muscles feel a little strain after 45 minutes of use. But with every use there after you get stronger and have less strain. By the fifth use I felt no strain. The Visor is now a part of my every wood turning adventure. I dream of the day when I get a unit like this with the motor, filter, and battery in a belt unit connected by hose to my light weight visor. Yes, I know the product exist with another company - but their price is outrageous. It's nice to have a cool breeze blowing across your face, really comfortable. After breathing in dust for years and years I made the plunge and invested in the Airshield Pro. Should have done it much sooner but certainly enjoy having it in my shop. I use it whenever I am sanding or doing anything that creates small dust particles. You want fresh air then this is the ticket! If you value your lung health, this is the unit to buy. Yes it's expensive but if you're going to be a wood worker, you need to do everything you can to keep fine dust out of your lungs. I've used mine several times for 8-12 hours at a time and it works great. The noise of the fan isn't noticeable compared to the sound of shop equipment and there doesn't appear to be any dust getting through the filters. The constant flow of fresh clean air across the face shield keeps it from fogging. Once you get the fit adjusted to your head and wear it for a while you will almost forget you're wearing it. Obviously, I like mine a lot. I have been using the Trend Airshield Pro for about 4 years. It works better than any other type of shield / mask I have used. Most of the others will for my glasses, this is not an issue here. My only complaint is the cost of the replacement filters. I think that about $50.00 is a bit too expensive. 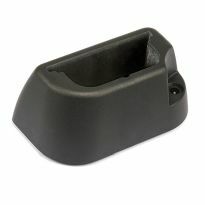 The hearing protectors also leave a lot to be desired in both protection and comfort. I have stopped using them and use ear plugs in their place. They are just too uncomfortable and never fit your ears well. I would recommend this product and the company that provides it. Yes it is expensive but so are your lungs and eyesight. I wear glasses. Wearing a dust mask they fog with the Airshield not a problem. 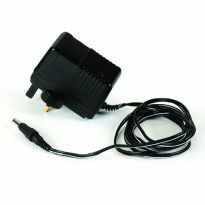 The motor is quiet and the air makes the Airshield easy to use during hot weather. Sanding while wood turning and you can breath. I've only had it for a week but I am so impressed with the quality, fit and the feeling of being free from conventional breathing masks. The first few days I would be turning and suddenly think 'I didn't mask up', it seems like it's not there with its comfortable fit. It is truly a feeling of being in a protective environment with no restrictive equipment. Battery life exceeded 9 hrs (and was still not sounding an alarm) and that was on the first charge. It's so good I had to give it 5 stars... even though the cost of a spare battery is rediculous and the non-smart charging system is nothing Trend should be proud of. I knew that prior to the purchase so that's on me, the unit itself is fabulous. Absolutely satisfied. Easy to use, Only regret not getting the ear protection. bought the Trend Air/Pro as a less expensive alternative to outfitting my shop with a room-size ventilation system. Prior to this time, I used various dust masks with reasonable success, but less than adequate. My wood working primarily involves carving and a lot of sanding. I gave the Trend Air/Pro a "5 Star" rating because it does exactly as advertised, and while I am still faced with a very dusty shop, at least the dust is not getting into my lungs. The unit fits very comfortably on my head. It is whisper quiet. There was a little initial confusion as the ongoing fan sound sometimes made me double check that I had actually turned off the tool I was using! : ) I experienced some neck fatigue the first couple uses, usually after 2 hours of carving/grinding/sanding. This is no longer a problem and I can wear the thing all day without fatigue. I would recommend this product highly; it is not a replacement for eliminating all the environmental dust in your shop, but it will keep you supplied with clean, dust free air while you are working. Nice product! Excellent air filter. Works exactly as described. This is a highly engineered air filter system. Mine works perfectly. I have a size 8 head, and it fits all the way extended out. I do not take it off, nor do I turn it off once I start woodworking. I charge it between uses. It I usually use it about 4-5 hours at a time. It is comfortable. I also have the ear protectors - which quiet machine noise, quiet the low hum of the airflow noise, and holds the helmet in place. I have the helmet a not tight so the ear cups actually hold the helmet snug - very comfortable. I have ashma - it is helping a lot, even though I also have a complete shop dust collection system. Wow what a difference. This is a really good product. It is a little too heavy after wearing it for over an hour, but it was very easy to get use too. I have it four stars for its weight on the head and the head strap. The head wrap is not the quality I would expect in an item of this price point. This does an excellent job of giving me clean air to breathe. I do have to get used to wearing something on my head all of the time. I have a little trouble opening and closing it past my glasses. After reading reviews, I did not get the ear muffs. I plan to go the ISO Tunes Pro rout. Still would recommend. 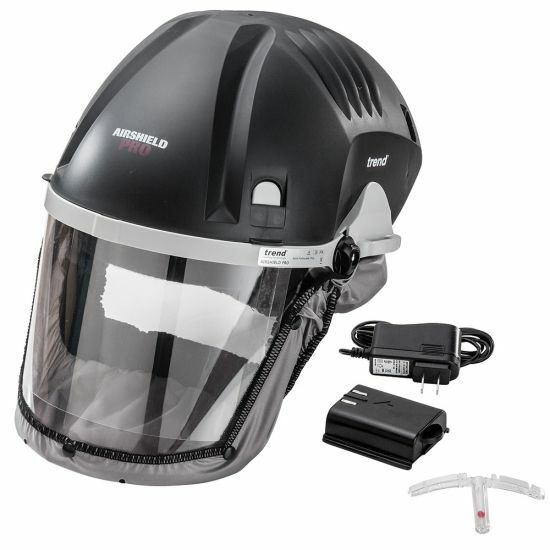 Purchased the Trend Airshield Pro because my lungs could no longer tolerate the dust I'd been breathing in. I had considered a Hobby Air system but did not like the idea of dragging a hose behind me around my shop. The Airshield is a terrific alternative to dust mask or respirators as it actually works especially for those of us that have full beards. I only gave it 4 stars because I feel the head gear could be improved for comfort and fit by a cross style top strap. I wear a welders cap under the Airshield to keep it from sliding on my hair and add a comfortable fit against the tightened head band. Wish a product like this had been available.hen I was much younger! It works as advertised. Need some time to adjust it properly. A little top heavy, so when you lean over it slides off. I would recommend this hood to anyone whoever tried to get by with paper masks and has glasses or facial hair. My sinuses are starting to clear up the fresh air extends the comfortable work time. If they could make it a little quieter it would get 5 stars. I found it to be lighter and less noisy than expected. Head band is very comfortable. However, after charging battery for the recommended time I tried the unit out and the electronics failed! Couldn’t turn unit off. I called Trend, they said they hadn’t heard of that problem and would send me a new power unit. Waiting on unit. Have used the air pro twice now. Works fairly well. Helmet can be a little heavy after a while but for the most part it works pretty well. For the most part it stays fog free. Although I was getting a little bit the other day when I used it. But not a whole lot. Been using it while I do lots routing and has performed well. Biggest down side is the overall cost. It's nearly $400 which I feel is over priced. Great option for keeping dust out of mouth, nose, and eyes. After trying many different masks and respirators over the years of remodeling and managing leased properties, i could never find one that worked decently with a beard and that would not cause the ridge of my nose to ache after a couple of hours. The Airshield is a product that solves several issues for me - no aching line on my nose, no dust in my eyes, no fogging up my glasses, and no seal necessary around the beard. I have used the Airshield so far in woodworking, plaster removal, insulation, mowing dried leaves, and cleaning up construction sites. It has worked very well to control dust. I do hope the designers will continue to improve new versions of the product, specifically to reduce the weight and to provide a HEPA level filter. Helmet is somewhat top heavy and a bit wobbly if you are leaning over or looking down a lot. Overall, I am happy with the Airshield and look forward to new design improvements. I really like the Air Shield. I feel protected and it is reasonably comfortable. Easy to put on and care for. Product has been a life saver for me. I have had several lung issue that have kept me out of the shop. Dust masks just don't cut it when you wear glasses. It's a little heavy at first, but you get used to it real quick. My only complaint was that it was a little pricey. I have only used it a few times. I build corian and Laminate casework and counter tops. My shop is small and the shop dust collection is not good. The hood is considerably more comfortable then using dust masts and It seems to work well. I think you have to baby it and keep it clean but it might be the answer for dusty environments. I thinks its expensive. But if it continues to work and last for a several years I will be quite happy. This is a great mask. I wear glasses and I have not had any problems with it fogging up. The internal fan does a great job of keeping the shield clear. The only issue I have with it, it gets to be a little on the heavy side. After doing about 20 /25 minutes of turning on my lathe, it started to get a little heavy, but nothing crazy..!!! Overall this was a great purchase. I am on oxygen and need to spare my lungs as much as possible. Getting to old to work without a really good protection for eyes, lungs. Recommendations from other turners and need for lung and eye protection. After looking at several other vendors, your price was the best. My Dad requested for Christmas, as he values his lungs and eyesight. Used one for years and time to replace. Needed better air filtration, especially for sanding on turnings. I do most of my wood turning in the winter months in an unheated, converted greenhouse. My regular face shield gets fogged up on the inside and needs frequent cleaning. Tired of old style nose pinching, dust in your eyes respirators while remodeling, woodworking, mowing, crawl space spelunking, and restoring old homes. 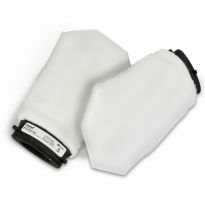 Looking for a comfortable option and Trend Air Pro has many good reviews! And, I have a beard and glasses...hoping this will be as good as reviewed! For protection during wood turning. As with most of the items I've purchased this year, the AirShield Pro is replacing the one I lost to the tornado. I have lung issues and wouldn't be able to enjoy my woodworking without it. Best price and trust in Rockler Woodworking. Good reviews by independent users with beards. Working with Arizona native woods is starting to take a toll on my lungs. As a wood turner and wood worker I needed protection from the dust. I felt that this was the best option as it should not fog my glasses. Hopefully Trend has learned from customer feed back over the years and improved the headband and battery. I will soon find out. Have had serious lung disease in the past - want to breathe clean air to protect lungs. I need dust protection that I can keep on for long periods without separate mask, goggles and ear protection. Works well if you do not have a very small head. Good reviews on it and to protect my lungs. How well does it work for metal grinding? Does it work with beards? BEST ANSWER: Yes it works with a beard. I have been using mine for a couple of years without any problems. I have the triton mask and air pump. Is this superior to the Triton ? Would it work for drywall sanding? Including sanding drywall ceilings for many hours. BEST ANSWER: I've used it for drywall sanding and it worked fine. Just vacuum the filters to clean them (should be done anyway). Sanding ceilings might be taxing because there's a weight over your head to control. It's not very noticeable when your head is vertical. I'm not an expert in drywall powder from sanding but I think it filters down to 2 microns (extremely efficient). Plus, with the police air pressure pushing out of the mask, it would keep pushing airborne powder away. How can I get a replacement headband? Are the filters washable? What is the typical life span for the filters? BEST ANSWER: I have used my Trend Air Shield Pro for about a year and a half. I regularly vacuum the filters off with my shop vac from the outside of the helmet (sometimes carefully from the inside) while they are still mounted. This seems to work well as the airflow inside the face shield is still testing fine fine. I have not felt the need to replace the filters yet (I do wood turning). Trend has been extremely helpful whenever I have a question. I'm sure they can answer your washing question. I would not be afraid to try it, but I'd probably call them first. Hope this helps. I believe so. Shaking/knocking out the dust has sufficed for cleaning mine. I expect them to last indefinitely. Does the Trend Air/Pro come with the 10 pack of visor overlays? The part number suggests so but there is no mention in the product copy. BEST ANSWER: There was not a 10 pack in the box but Rocker stood by their greatness by giving me a pack off the shelf. 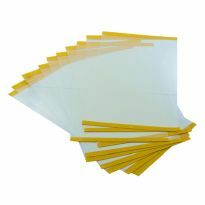 Read the package details it does state a pack of 10 overlays in deal. Mine came also came with one installed and an extra pack of 10. Mine came with one on the visor and a pack of 10 extra. How long does the filter last during normal use? Say, 3 hours per day? BEST ANSWER: Depends on how much particulate matter is in the air.. it would also depend on what you are filtering, sawdust would be very different from plaster. Once a month is probably a good rule of thumb. I have had no problem using it for multiple days at three hours a day. I am a woodturner and so always have it on and running, sometimes the chips are bigger and then I also sand the pieces on the lathe. I don't use it only for sanding. I just knock the dust out of the filters once a week or so, or use my compressed air on it. How long does the battery charge last? I know it says eight hours but I've heard it really doesn't last that long. BEST ANSWER: When I first received mine, I had a lot of problems getting the battery to last more than about 1 or 1 1/2 hours. I called tech support and they sent me a cradle charger because I was just charging my battery through the helmet. When I began using the cradle, the battery immediately began going 8-10 hours on a charge. I have had no problems since. I have been very unhappy. The charge for me lasts less than 20 minutes. It may be because it stays plugged in. however, if it isn't plugged in then it would never be charged when I need it. Longest I have used mine is about 5 hours it was fine . I shut it off for 30 min. While I had lunch . my husband says it usually lasts about 4-5 hours per charge. How long does the battery seem to last for you? I have a beard can I still use the air pro? BEST ANSWER: Yes, you can. It's hard to see but there's a perforated, elastic band that runs around the faceplate which serves as an exhaust for the internal fan as well as a seal around your lower jaw. It extends below a beard without any tightness or restriction. I don't have a beard, but I think so if it is not a really big and bushy beard. The elastic part that goes under your chin is fairly flexible. Hope this helps but you might want an opinion from someone with a beard. I would think so ,as the shroud in the picture shows that it covers the whole facial area , sealing it off from the dust particles. Yes, it doesn't have a sealed fit. I would like to know exact price as well. My battery is giving out. Easy answer: ROCKLER CATALOG SELLS IT FOR $72.99. Sorry. I returned the item, because I did not like all the weight at the top. So I have no idea about batteries. You might check with Batteries Plus. They seem to sell almost every battery made. I don't know. I haven't had to get extra batteries yet. Is item compatiable with oxygen users ewho wear a cannulus 24/7? BEST ANSWER: Although I don't wear a cannulus I know what it is and see no reason why it wouldn't work just fine with the Airshield Pro. The reason I say this is because of the flexible/stretchy fabric that circles the face. It's intended to be comfortable so it would allow for a tube to enter almost anyplace from ear to ear. I can feel a little air leaking out of the mask near my ears at times but it's due to the positive air pressure inside the mask. There are also a few manufactured holes under the chin which are there to let the air out. It's an extremely comfortable experience and I'll bet it wouldn't cause any issues with your setup. Good luck! I really don't know, but my guess would be that would not be compatiable. You might want to ask some one who supplies your oxygen. Does this helmet meet ANSI type 1 impact protection? BEST ANSWER: I am not qualified to answer that question..I ordered the helmet because i have an incurable lung disease-f that has helped me enjoy the out doors again. contact Trend Airshield Pro direct for your answer. 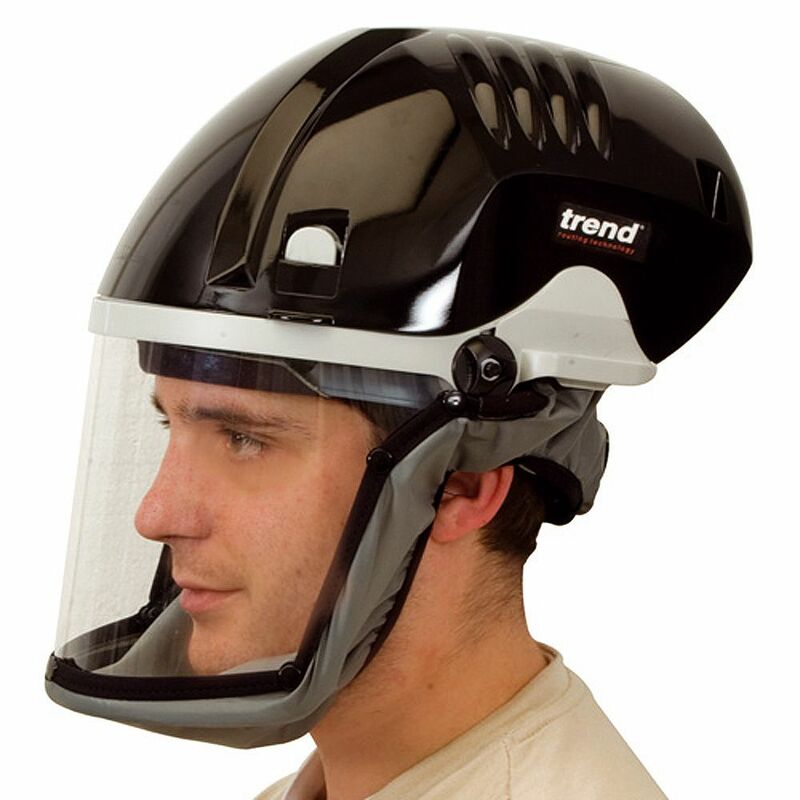 The Trend Air/Pro face shield is rated z 87+ High Impact Protection. This is low energy impact . I use it on my wood lathe but would use safety glasses with side shealds if I was using an air nailer. Not sure about ANSI type 1 impact protection. It is pretty well built and a solid face shield. Definitely better than saftry glasses or my other face shield. I work renovating various vintage items usually made from metals such as brass copper and cast iron using a electric polishing mop and abrasive polishing compound, which creates a lot of dust, so I am just wondering if the blown air helmet would be suitable for protecting my lungs in this job? 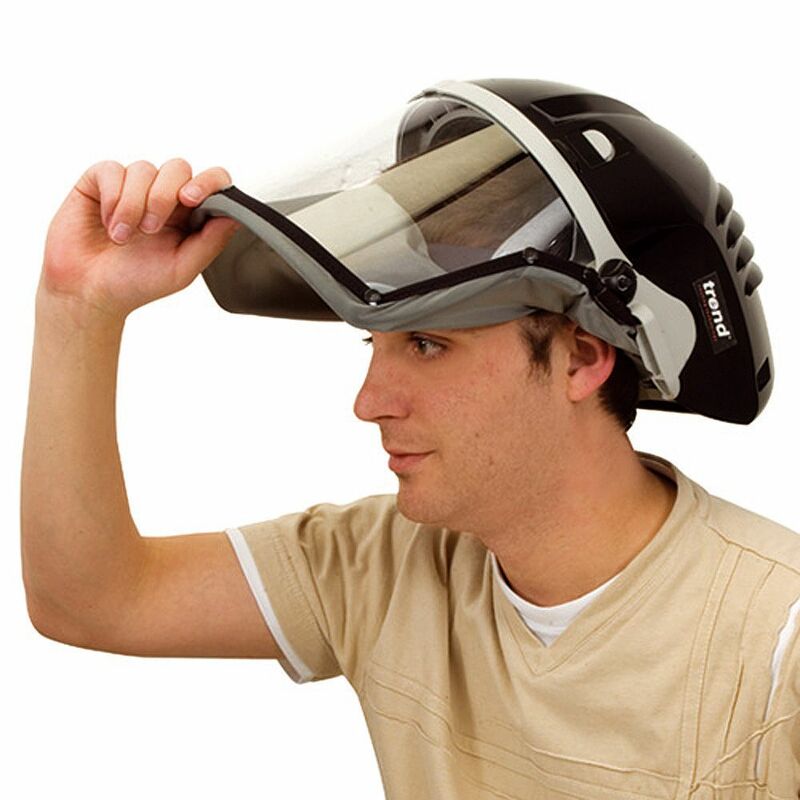 BEST ANSWER: Yes the helmet is ideal for protecting its wearer against particulate inhalation. It ia not intended to filter solvents and does not contain a HEPA filter but will effectively block rust particles and most dusts and mold spores. I feel that it will if it is just the dust you are worried about. It does nothing for the fumes that may be generated if the process creates them. It does well in keeping the sanding dust from wood out. I need to wear glasses all waking hours . Will this mask cause my glasses to be an irritant? I am a glasses wearer myself (bifocals). I have been using the Airshield Pro for about two years and have had no problems with it. The circulating air keeps my glasses clearer compared to when wearing a traditional face shield or safety glasses. You may have to adjust your head slightly to get clear vision through your glasses and the face shield, but well worth the investment. I wear glasses too. It's not a problem. Also, I found that wearing a knit watch cap under the Air Shield Pro makes it much more comfortable. I use a smart charger rather than the one supplied with the unit. You can learn more about that on U-tube if you are interested. Air Shield Pro works great. I would buy it again. Having to wear glasses all the time could be a problem for you. If you use this unit most of the time. I wear contacts and have had no issues. I wear prescription safety glasses when using mine with no problems, however your mileage may vary. I use a prescription glasses with the mask and works well for me. I wear glasses and have no problem whatsoever with the mask. No. I wear glasses with this mask without anybissues. I work with heavey equipment in dusty conditions. will this work for me? BEST ANSWER: I'm sure it would. My two comments on the unit are 1. if you spend a lot of time bent over, like over a work bench, the mask tends to slip forward unless you really tighten the head band which tends to give me a headache after a while. Secondly, the noise factor. I use it for sanding. It keeps a lot of dirt/ and sawdust out of my face eyes and Lungs. After an hour or so it gets a little heavy on my neck and I need to rest. The Tool is a good aide! It could. I find it doesn't secure snugly to my head. Maybe for you/your head you might get a better fit. It does take a little getting used to. I believe that it will Bruce. Mine filters out fine particulate dust, so I'm certain it will also work in dusty conditions too. It should help a lot. I use it for woodworking since I have become sensitized to the dust of a few wood species. Can eyeglasses be worn when using mask? BEST ANSWER: Yes, I wear them. Best thing about this is no small face mask and the fresh air giving positive pressure so you get no dust in your eyes or nose. I have no problems using my reading glasses with my Airsheild pro. The filtered air flow from the top of the mask keeps the glasses from fogging and filter keeps the dust out. Very satisfied. I suppose it depends on the size of the eyeglasses, but mine have plenty of clearance. Absolutely! I wear eyeglasses and wear them while using the mask with np problem. I HAVE ONLY USED IT ONCE NOW MY BATTERY WONT RECHARGE. Is there suppose to be a light on the charger when its charging? BEST ANSWER: Hey Tim is it possible you have the battery installed incorrectly? I did that the first time I installed the battery. If you aren't having success visit the folks at Rockler! Thanks mike I will check it out. My battery stays in the helmet while charging I plug the charger into the helmet. Does the cradle work better? Can the filters be washed and reused? BEST ANSWER: Michael I would not wash the filters donto the manner they are constructed. If you do I would not recomment any soap as this will leave a residue which will clog more quickly and also restrict air flow. Carefully vacuuming the filter will pull the dust back the direction it attached and proling filter life..
As this is the fundamental purpose of this expensive device I would recommend filter replacement at least every other cleaning.. Always think of your own protection over cost.. The filters cannot be washed and reused. This is an industrial quality product and is designed to be used in very dusty environments. A little pricey, but a good product. Sorry, I returned the unit right away, because I did not like the weight distribution. I cannot answer the question. Is it satisfactory for glasses wearers? BEST ANSWER: Yes, I find it very helpful with glasses as the air across your face from the fan will keep them from fogging up from your breath as they do with a face shield and/or mask. Yes. I wear safety glasses under it all the time. Wearing safety glasses is a habit while in the workshop, so I put on the Trend helmet over the glasses. yes, it works well with glasses and you no longer have to clean your glasses when you are woodturning!!!! I wear glasses and have NOT had any issues wearing them with the helmet. Yes. I wear shop bifocals with no problems. Does this come with a draw string hood so dust doesn't get into the helmet? BEST ANSWER: The vents in the top of the helmet draw air into and over the plastic faceplate by way of the rechargeable fan, also located in the top of the helmet. Each of the 2 sets of vents has a replaceable filter that keeps the dust from entering the helmet. It doesn't come with a draw string. It comes with an elastic band about 1 1/4" wide all the way around the face opening. I haven't had any dust infiltration problems. I does not have a drawstring but the material around the face shield has elastic around the edges that goes under your chin and up the sides. It comes with elastic fabric from the shield that fits around the face, which does not allow dust to get in. Yes it does. I really like it a lot. Thank you Roy& Jim. I appreciate the answers. I'm going to try he fabric sheets first because i have them, them I'll try to find the static cleaner on line . Have you tried to wipe it with a fabric softener sheet? I'm a full time refinishing tech in a body shop, would you recommend this as a good respirator? Good luck out there... remember the route of entry for VOC chemicals is through the lungs. While I love mine for woodworking I do not use for wallboard sanding ornother ultra fine particulate. This is only designed to filter dust, which it does very well. The optional ear protectors are also a plus. If you are being exposed to paint or chemical fumes, you'll need something else. Does it filter out organic odors? I own a biohazard remediation company and looking for an alternative to the half face respirator. BEST ANSWER: No, it's just a filter. Battery life and the weight of having the battery on top of one's head mean that it might not be a good choice for you. When I was looking for this, I found that 3M makes things more like what you're looking for. not with the filters it came with. i haven't found ny filters for it capable of filtering out organic volatiles. Sure wish it would, since it'd be great for spraying lacquer and other stuff. No it doesn't filter out organic orders. This unit is nothing more than a highly over priced dust mask. I am only getting 2 hours use before it beeps to recharge the battery. Do I need a new battery? Don't see them listed for purchase. BEST ANSWER: Check the battery connections for cleanliness first! If they look clean, cycle the battery in and out several times. If they look dirty, try something more aggressive like a pencil eraser or 2000 grit sandpaper (can't do this too many times). It's amazing how much of a difference this can make. Just rolling a cylindrical battery inside a TV remote or kid's toy can do a world of good. If you're really sure that the connections are good, then yes you need a new battery. I get at least 4 hours per charge. Rechargeable batteries only last for 500-1000 cycles unless they're high-end batteries babied by sophisticated algorithms. I've had mine for about 14 months but have only gone through 3 charges... usually after about 8-10 hrs of use. Batteries are expensive but I've seen them online, not necessarily on the rockler site. I get several hours out of mine but usually don't last that long. I find the noise bothersome. Sounds like you need a new battery. Replacements are available. Is it possible to use in mildly freezing temperature? E.g. 30F / -1C. I'd think in this case the "cooling" will work against me and freeze my face? BEST ANSWER: I don't see this as a problem. Exhaled breath is near body temperature, therefore no freezing. Note: I used to be a regular long distance runner and often ran in sub-zero temperatures down to -40 degrees F without any breathing freeze! I wear a stocking cap under the helmet. I'm a mason and need protection from silica dust and often work in hot dusty locations.im looking for a light weight air assist respirator Any thoughts on this one? I think it would work. You would most likely have to exchange the filter often because of the masonry dust. It is comfortable in my woodshop, but I’m always vertical. Would this work in the cold? I work in a cold MN garage in the winters and need something that won't fog? BEST ANSWER: I live in Southern California, so "cold" isn't something we're familiar with. However, I would be surprised if it fogged. The air flow inside the face shield is pretty good, which will reduce humidity and temperature inside, which ought to prevent fogging. I don't have experience with those types of temperatures but you get a pretty good air flow behind the mask so the temperature should be pretty close to the same both sides of the shield. I would be surprised if fogging would be a problem. Can I use this for lead paint during RRP work procedures? BEST ANSWER: In my opinion, no. I wouldn't use it for any type of lead removal. Weather its paint or actual lead abatement. The unit doesn't seal well enough and the filters were not designed for heavy metals. I don't think it has any chemical filtering at all. Absolutely fantastic for wood dust, which some are toxic, but not a chemical mask. I've used it a little while working with CA glue knowing that it's positive pressure so it's at least keeping the fumes from directly entering my nose. I don't see why not. The paint will be particulate matter and the works well for that. It may be worth checking with Trend though.